Talking about F1: The F1 blog: What is right and what is wrong on team orders? It was possibly the most glum podium in F1 history. 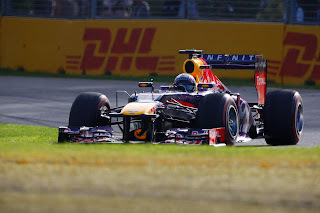 Red Bull had claimed a one-two finish on a day it was expected to struggle, after an exciting wheel-to-wheel battle for supremacy. Winner Sebastian Vettel in so doing put clear points over those he's expected to be in a title fight with this year. While Lewis Hamilton finished in third, his new team's car showing that it has potency on race day and is much more competitive than many had thought/feared in advance. Yet, you'd never know it. Of the three drivers' faces two were sheepish and the other angry. It was team orders what did it. Both Red Bull and Mercedes, whose cars had ran in close formation at the front for most of the Malaysian Grand Prix's duration, chose to enact a 'hold station' order from the pitwall after their final stops. This should have meant that Mark Webber finished ahead of Vettel to win and that Hamilton finished ahead of Nico Rosberg in third and fourth. Rosberg chose (however reluctantly) to obey the order; Seb didn't and won the race. So, Vettel did wrong? It seems so. He confirmed after the race that he heard the instruction as well as apologised for making a 'mistake' in taking the lead to win. But it's hard to believe that Seb didn't know what he was doing. It appears most likely that his competitive instincts took over and he couldn't resist seizing the extra seven points on offer, regardless of everything else. As a starting point, we should repeat the maxim that is laboured: team orders are an inescapable part of F1. Indeed, they are an inescapable in an endeavour in which individuals from the same team are put into competition with each other (and if you think team orders are bad in motorsport you should see road race cycling, where eight cyclists out of teams of nine have to act in total support of a pre-ordained team leader at virtually all times). But the whole team order issue in F1 is also much more nebulous than first viewing might suggest. And indeed we saw as much today. Red Bull and Mercedes did broadly the same thing for broadly the same reasons: holding positions after the final stops so that its cars reach the end without rancour. In one case there is criticism for enacting the order, in the other there is criticism because the order was defied. And in that latter case the same driver was criticised for asking for team orders earlier in the race only to be criticised, probably by a lot of the same people, for later ignoring them. In both comparisons, it is difficult to have it both ways. Sadly history doesn't offer us much of a guide either on what is right. While the likes of Stirling Moss, Peter Collins and Ronnie Peterson are recalled fondly for their honour in abiding by an instruction, other cases muddy the picture. Ayrton Senna disregarded an agreement with team mate Alain Prost in Imola 1989 by passing him, which was the real starting point of their famous feud (not that you'd know it from the Senna film) and yet these days at least Senna receives little criticism for it, though that may be a part of the general deification of Senna's driving that took place after his death. Earlier, Carlos Reutemann won the Brazilian Grand Prix in 1981 having refused to cede the lead to team mate Alan Jones (and the team order was stipulated in a contract that Reutemann had agreed to of course). 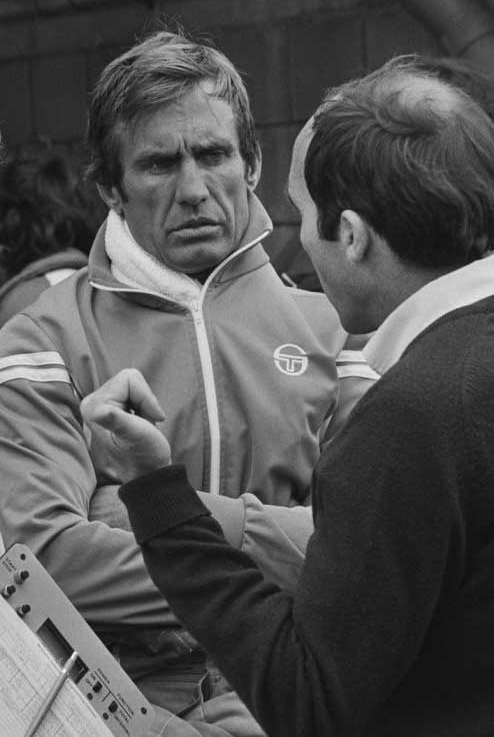 The historical consensus is that Reutemann did the right thing. Same goes for Rene Arnoux who did similar in regards to team mate Prost at the French round the following year. While on the flip side some believe that the reputations of Felipe Massa, David Coulthard and Rubens Barrichello never recovered from being 'demeaned' by giving up a place and/or refusing to seek to pass their team mate ahead; their honour in doing so barely is applauded, indeed some in the warped world of F1 view it as a weakness. Plenty have since stated openly that they should have defied the order. And then there is probably the most notorious case of this in F1's history, also conveniently with close parallels to what happened today, Didier Pironi claiming the win in Imola in 1982 from stable mate Gilles Villeneuve late on as both 'cruised' to the end in order to preserve fuel. Pironi has in many quarters achieved bogeyman status as a result, particularly as two weeks later a still livid Villeneuve crashed to his death at Zolder (to make a brutal point: if that hadn't happened would Pironi be viewed in quite the same way?). Today, Rosberg broadly played the Pironi role, protesting that he couldn't attack his team mate ahead as both cruised to the finish, and yet Rosberg is seen as the hero of the piece. It all seems to add up to a certain confusion of what is acceptable and what isn't. Perhaps this is inevitable when trying to square the 'honour' of obeying a team's instructions with the 'honour' of fighting it out for position on track, two very different things. There may still be calls for the FIA to 'do something'. There may even be a knee-jerk reaction from the powers-that-be as there was after the Hakkinen/Coulthard case in Melbourne in 1998. But it's unlikely to be helpful. As we've found out more than once, seeking to ban team orders doesn't work, just drives the business into subterfuge and serves to make the sport look even more foolish. We may, as before, just have to learn to live with team orders as an inescapable part of the sport, however grudgingly. As well as that in certain circumstances an F1 driver, such is the way with many of them, may chose to ignore them. So, what are the likely implications for Seb? On the face of it, there are few. There will almost certainly be no sanction from the governing body, and as we know he rules the Red Bull team and has done for a long time, so his employers are unlikely to impose much sanction either. He may lose a few sympathisers, though like most of the top drivers Seb would likely subjugate popularity for results any day of the week. More regrettably Vettel's legacy might end up with an asterisk against it like Senna's and Schumacher's (and Pironi's) have for their misdemeanours, though probably only significantly so if such things crop up from him again. And fairly recent history suggests that the negative implications for drivers who do choose to ignore an order may be less than for those who obey them. As mentioned, some recent reputations are thought to have never recovered from ceding to the will of their team, while it's hard to pinpoint the careers themselves of the likes of Reutemann, Pironi, Arnoux and Senna being damaged by ignoring them. It seems that in this game no one (among the protagonists anyway) ultimately objects to a determined winner. But one big implication that may not have entered Vettel's calculations, at least not at the time, is that in his endeavours to win world title number four this year he likely cannot now count on support from across the garage to do so. And such is F1's way that may yet come back to bite him. For example, imagine if in this year's final race with the title at stake we have a similar situation as in Brazil last year, except Seb needs to rise one more place to claim the title. Last year he could have counted on Webber up ahead clearing out of the way. Would anyone be so confident that Webber would comply now, after today's events? And we've seen generally in McLaren in 2007 as well as in 1989, and in Williams in 1986-7 as well as 1981, that intra-team warfare can bring an incredible strain generally upon a squad. Seb's campaign for title number four got a little bit harder today. And it all gives us insight into Vettel's character. As we've suspected for some months and years it's clear that Seb has a game face, one which is rather different from the smiling schoolboy on show for much of his downtime. And it's also insight into why Vettel's won so much, and will no doubt continue to win things. Just as with many F1 champions before him, single-mindedness like that you cannot manufacture. Further, and like it or not, I can think of many revered F1 drivers past and present who would almost certainly have done exactly as Vettel did. Indeed, within this I found Vettel's post-race apology in a strange way the hardest bit to take of the whole matter. My view is that if you're going to be ruthless enough to take the extra points on offer then fine, but don't seek to have it both ways by claiming that your conscience is troubled by it subsequently. After all, Vettel had several laps to give the place back to Webber and he didn't. And he seemed pretty happy as he celebrated on the nose of his car in parc ferme after the race. Jacques Villeneuve's reaction to Rubens Barrichello ceding the Austrian Grand Prix in 2002 to Michael Schumacher, virtually on the line, and Schumi's behaviour on the podium and expressed claims afterwards indicating that he was troubled by it, summed up my views now as they did then: 'I don't have a problem with the team orders - the only thing I found unacceptable was the podium situation, if you win a race, even if it's in a way you don't like, then be a man and go up on the top step and take the trophy even if you are embarrassed because everyone is booing you. It would be stupid not to take anything you are given so if you are given a win then take it. But stick with it, don't say it's embarrassing and wrong and say you feel bad about it.' Amen, Jacques. I was under the impression that it was explicitly written into many driver contracts that they are to heed the communication from the garage as absolute. Yes, I'd imagine it would be, but in practice it seems not much happens if you do defy instructions. It's particularly rare if you dominate your team like Vettel does. Let's face it, Red Bull isn't going to do anything to put his nose out of joint, is it? I certainly hope Vettel is in a position to regret his lack of restraint later in the season, and it would serve him right if he loses the championship because of it. If the positions had been reversed, you can be sure Vettel would be complaining extremely loudly. It's going to be fascinating to see how Mark is going to deal with future situations. If Mark reciprocates later on, I won't blame him. What goes around comes around! I would tend to agree with a comment by David Hobbs on the NBC Sports broadcast of the race, that perhaps, it was payback for the way Webber drove in last years race in Brazil. Vettel was driving a damaged car, fighting for the title and Webber did him no favors almost forcing him off the track at one point at turn one. 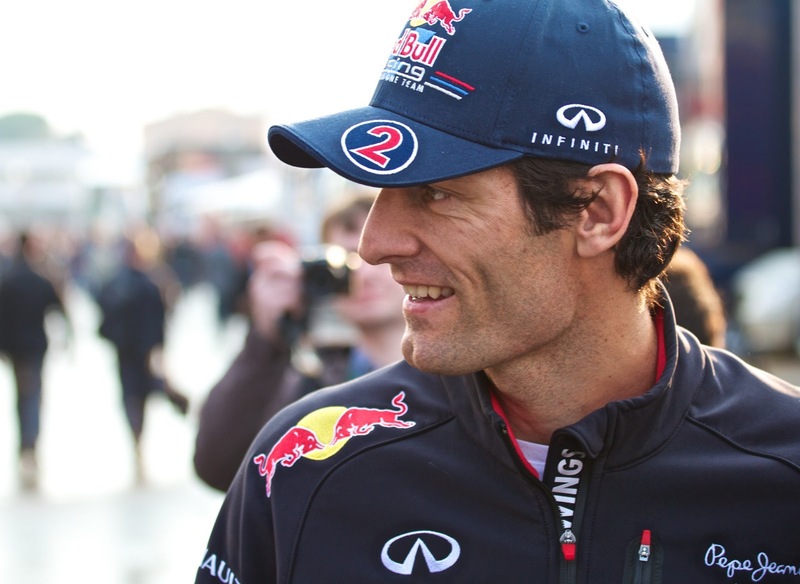 Webber reminds me of Montoya, always talking, causing problems, driving a wide car, but basically punching above his weight. Quick correction on the situation with Senna and Prost at Imola in 1989. In Senna's mind, the agreement was that either driver was not to attack under braking for the first corner, which he did not do. Senna had initiated his passing move on Prost well before the first corner braking by slip-streaming on the straight and by the first corner braking zone was already lined up with Prost. He was in the better position, therefore he went ahead. That was all. And this agreement was suggested by Prost, not Senna, back in 1988. My source is the book "Ayrton Senna the Whole Story" by Christopher Hilton, Chapter 10. Perhaps you should double check your source of information on the matter. I do not know if you have a reliable source or not (seems like you read wikipedia). I also think that this situation with Vettel and Webber should not be compared to that of Prost and Senna because the latter was NOT a team order. RJ - read my article again. I say 'Ayrton Senna disregarded an agreement with team mate Alain Prost in Imola 1989 by passing him'. Therefore, I state explicitly that it was an agreement between the drivers and at no point claim it was a team order. I've no idea how you reached the conclusion that I was saying otherwise. And I don't agree that this makes the case non-comparable with what Vettel did in Malaysia. Indeed, I believe there are a lot of parallels between wheat Senna did in Imola and what Vettel did in Sepang (though you could argue that what Senna did was worse, given it was an agreement he happily entered into - whoever initiated it - that he defied rather than something imposed by his team). And I'm aware of Senna's line of defence that he slipstreamed past Prost rather than outbraked him. But I, rather like many observers at the time, felt that Senna was splitting hairs with that distinction. And for what it's worth Prost doesn't concur that the braking zone was specified in their agreement. As for my sources, no I didn't use Wikipedia. The main source for the Imola 1989 case was my own memory, as I watched the race live on TV and I also remember the subsequent fallout and debate on what Senna did (I was a nine-year old F1 obsessive, who incidentally hero-worshipped Ayrton Senna). I've since read many books covering the subject like the 1989 Autocourse as well as several other books and other accounts on Senna and others. I just wanted to clarify. By the way, I knew that you had referred to the Senna/Prost situation as an agreement, I was just questioning if that situation was comparable to the Vettel/Webber situation (because of that fact that the one was an agreement between the drivers and the other was instructions from the team). I never accused you of claiming the Senna/Prost situation as a team order! Also, if you are aware of Senna's reasons for doing what he did, do you think that it is still the same as what Vettel did to his team? In my opinion, Vettel had firm orders from his Team not to pass and still did it which is clearly wrong, but Senna found a loophole in their agreement and exploited that. Senna was just being a smart-a**! There is also the element of the actual pass as Vettel's pass on Webber was very risky while Senna's pass on Prost was low risk. I try not to defend Senna but in this case I really think that it is unfair to compare Senna and Vettel. Vettel's actions in Malaysia further strengthen people's image of him as childish. RJ - if it was your intention solely to clarify then why is your 'seems like you read wikipedia' comment necessary? That can only be interpreted as a calculated insult. And as for your main argument on comparing Senna's and Vettel's acts, no that doesn't make a difference for me. 'Finding loopholes' can be a defence in legal cases but not in cases such as this when it is morality, i.e. right and wrong, that we are assessing. Senna might have found a loophole to justify what he did, but he was not an idiot and therefore it's impossible to believe that he didn't know exactly what he was doing. Which was going back on an understanding made in order to get personal advantage over an unsuspecting teammate. Therefore, I do not draw a moral distinction between what Vettel did and what Senna did, they were substantively one and the same. If you took it as an insult I apologize, but I had to put that there to catch your attention! I respect your opinion and think it is a good one. However I also think that a moral distinction can be made between the two situations solely because the agreement was never broken between Senna and Prost. Senna never attacked under braking. Thanks RJ - if you didn't intend it as an insult then I accept that and apologise also for misinterpreting what you said. I think we may have to agree to disagree on this Senna business. I've always been aware of Senna's line of defence that he felt he slipstreamed past rather than passed under braking, but as I said it's always struck me that Senna was splitting hairs with that. No worries. I agree to disagree as well. Thank you for responding to my comment. I think this was a great article and a much needed one in Formula 1 right now. To me what Senna did is even worse than what Vettel did. He broke what I call gentelmen's agreement not a corporate (Rea Bull)instructed type thing. There's no chance Senna or you can justify that. I agree with Red Bull's team instructions to hold stations as the team had everything to lose. Mercedes on the other hand should have let faster Rosberg through to have a chance of better position, maybe even a win. Maybe Lewis should let his team mate pass on his own. Long gone are times of chivalry in F1! My name is Viktor and previous post was mine. To clarify why I think Prost would do that. Spain 1986. Mansell pits 10 laps till the end of the race. Order 1. Senna, 2. Prost 3. Mansell. Nigel is catching Senna and Prost by about 3 secs a lap. Senna pretty far ahead of Prost. Mansell catches Prost but loses quite a bit time behind Prost. Mansell finally overtakes Alain and goes in pursuit of Senna. At the end Senna won by the closest of margins. After the race Alain apollogises to Mansell saying:" If I had known you could do it I would have let you through." That's why I believe Prost would let Nico through in Lewis' place. I read that in Prost's autobiography and got confirmfation from Mansell's book. Graham great blog you got going here. I discovered it yesterday. The best articles by far and well balanced too. I'll be your regular reader from now on.